Thirty years, with lots of time, and maybe not so much money, makes for a VERY long vacation. So what retirement life and work will you engage in? That is a VERY important question. Whether you are about to retire, already retired, urged to retire or involuntarily downsized, the retirement experience is a seismic shift from known to unknown. While there are many books to help you with your retirement finances, what about your retirement life? What will engage you and make this final third of your life meaningful and right for you, to be lived energetically, creatively, and productively? Shifting Gears to Your Life & Work After Retirement is a one-source “call to action” to invent your own personal and professional Next Phase. It will be your guide through the possibly shattering, but ultimately exhilarating, process of defining and pursuing the path best suited to who you have become, and who you want to be when you “grow up” again, this time. What Will Your Retirement Life Look Like? Work? Play? Travel? Volunteering? Or a combination of all these? At home or abroad? Alone or with a partner? In cyberspace or from home or in the workplace? Full or part time? Earning more money or living on what you have? Income may or may not be first on your list for what you will miss most about working. Even more critical, how will you replace your sense of social connection, purpose, mental stimulation, relevance? And how will this sea-change effect your essential relationships? 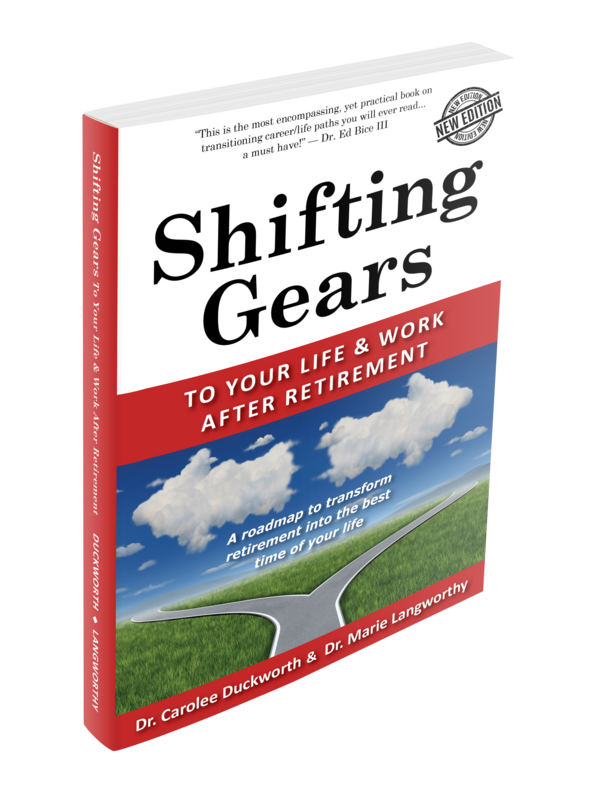 Shifting Gears clarifies and demystifies the confusion, even the panic, surrounding this crucial transition, and helps you design your own ideal retirement life path. What Will Make Retirement Life Engaging, Meaningful & Fun for You? This book is your personalized guide through a proven process to create your own compelling, specific road-map to your final and BEST opus. Get ready, world, for the onslaught of healthy, somewhat well-heeled Boomers, soon to be numbered at more than 77 million, who are not willing to be defined by the number of candles on their birthday cake. 10-Point Retirement Countdown to let go of the old. Proven 5-Step Process to create your own exciting new retirement. 7 engaging pathways to pursue or combine. 5 categories of work, including pursuits you may not have thought of. Sample matches of your uniqueness with absorbing options of pursuit. Specific resources to optimize your passage. Snapshots of retirees who invented their own compelling retirements. Current and emerging technologies & their significance for your future. Issues & needs that arise when retiring jointly with your partner. A goldmine of updated websites to supercharge your journey of discovery.